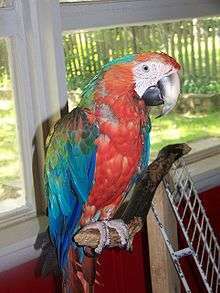 A Catalina macaw - a blue-and-yellow macaw x scarlet macaw hybrid. A bird hybrid is a bird that has two different species as parents. The resulting bird can present with any combination of characters from the parent species, from totally identical to completely different. Usually, the bird hybrid shows intermediate characteristics between the two species. A “successful” hybrid is one demonstrated to produce fertile offspring after mating. The description of bird hybrids results from observations in nature combined with those obtained in captivity such as in zoos per example. 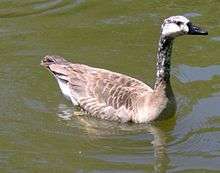 A hybrid between a Canada goose and a domestic goose. A mule, a hybrid between a domestic canary and a goldfinch. Goose hybrids, including Canada goose x greylag goose, emperor goose x Canada goose, red-breasted goose x Canada goose, Canada goose x white-fronted goose and barnacle goose x Canada goose see also Gamebird hybrids. Other hybrid ducks, including northern pintail x mallard, ruddy duck x white-headed duck, ruddy shelduck x common shelduck, white-faced whistling duck x plumed whistling duck, Baikal teal x northern pintail, hooded merganser x smew, Eurasian wigeon x American wigeon and mallard x New Zealand black duck. See also Mariana mallard and Gamebird hybrids. Aptenodytes patagonicus (king penguin) X Aptenodytes forsteri (emperor penguin) commonly named the 'kingemperor' hybrid penguin. A probable galah x little corella hybrid. This is an example of intergeneric hybridization in parrots. Note that the width between bars is unsafe for a bird this size. Inter-familial hybridization in birds is generally unheard of. Eolophus roseicapillus (rose-breasted or galah cockatoo) X Cacatua galerita (sulphur-crested cockatoo) hybrid cockatoo. Eolophus roseicapillus (rose-breasted or galah cockatoo) X LicmetisSpp. (corella) Sometimes referred to as "garella", occurs occasionally in the wild. Platycercus eximius (easterned or golden-mantled rosella) X Psephotus haematonotus (red-rumped parakeet). Aratinga jandaya (jenday conure) X A. solstitialis (sun conure) commonly known as the 'sun-day' hybrid conure. Captive songbird hybrids, such as mules, (canary x British finch) and crosses of finch species. Birds of paradise include several examples of both intraspecific and interspecific hybridisation. "Instant speciation" via polyploidy etc.